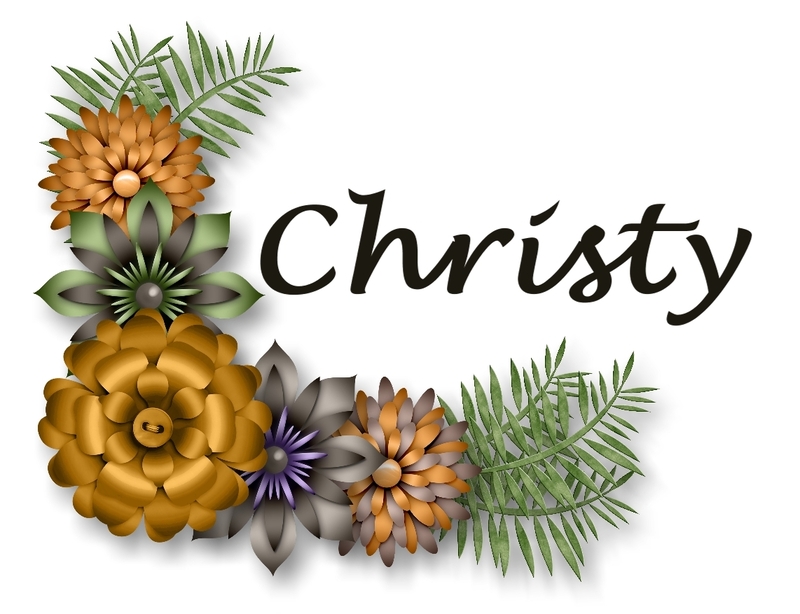 Welcome to Create With Christy! I'm so glad you're here. 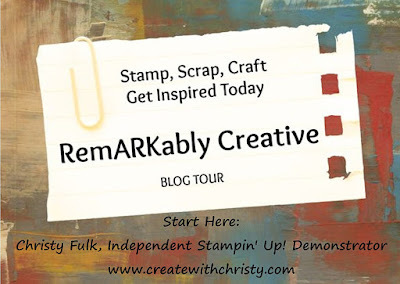 I'm once again participating in a RemARKably Creative Blog Hop. 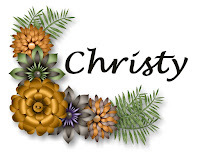 The theme for this blog hop is Easter. Yesterday, I made an Easter Bunny card, but I wanted to make a card for the real reason we celebrate Easter today...Our Savior's Resurrection! I really love this stamp set/die set bundle, and I'll definitely be using it for more than just Easter. The bundle is the Hold on to Hope Bundle, and it's in the Occasions Catalog. I also used the beautiful Springtime Foils Designer Series Paper (DSP) from the 2nd Release Sale-A-Bration (SAB) brochure. 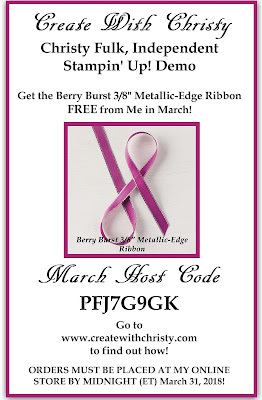 You can get it by placing a $50 order (before shipping & tax) by March 31, 2018. I decided not to use the cross stamp from the stamp set, but decided to die-cut the cross out of a piece of Wood Textures Designer Series Paper. I love how it looks! I like how the Layered Leaves Dynamic Textured Impressions Embossing Folder coordinates with the Springtime Foils DSP! I didn't think about it until after the card was finished. I love it when things fall into place like that! Emboss the Whisper White base layer by running it through the Big Shot with the Layered Leaves Dynamic Textured Impressions Embossing Folder. Attach the Springtime Foils DSP piece to the top of the embossed base layer. Emboss the Whisper White embossed strip using the vine-like folder from the Petal Pair Textured Impressions Embossing Folders. Attach it across the middle of the Crumb Cake embossed strip mat piece. Then, attach it across the bottom of the DSP on the card (see picture). 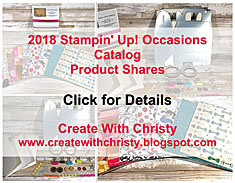 Ink the large floral vine stamp from the Hold on to Hope Stamp Set using the Tranquil Tide marker (leaves), Berry Burst marker (five-petal flowers), and the Fresh Fig marker (lilac-like flowers) from the 2017-2019 In Color Stampin' Write Markers. Stamp it onto the upper, left section of the Whisper White main image piece. Die-cut a cross out of the Wood Textures DSP piece using the large, plain cross die from the Cross of Hope Framelits Dies. Attach it to the right side of the piece, letting the right end of the cross hang over a little bit. See picture for placement. Stamp the "God is Love" banner stamp onto the Crumb Cake greeting banner piece using the Berry Burst Classic Stampin' Pad. Die-cut it out with the banner die, and attach it across the bottom of the main image layer. Attach the main image piece to the center of the Crumb Cake main image mat piece. Attach the whole thing to the center of the card using Stampin' Dimensionals.